InfoQ.com is facilitating the spread of knowledge and innovation in professional software development. InfoQ content is currently published in English, Chinese, Japanese and Brazilian Portuguese. With a readership base of over 1,400,000 unique visitors per month reading content from 100 locally-based editors across the globe, we continue to build localized communities. This eMag brings together some of our favourite writing, interviews, links to presentations and so on from a year of QCon. While the conference featured 18 curated tracks that covered nearly all of the major trends in software today, there were three that seemed to thread throughout the conference: Artificial Intelligence / Machine Learning, Microservices, and Ethics. At the beginning of April, we ran our inaugural QCon.ai event conference at Parc 55 in San Francisco, with a focus on AI, machine learning, and data engineering for software engineers. Our motivation for launching this event is that we believe that many of the techniques coming out of the various data-science disciples are fast becoming essential tools for software developers, and we wanted an event that would allow us to go much deeper into the topic than is possible at a typical QCon to help equip our attendees for this change. QCon.ai was a three-day show with four in-depth workshops covering TensorFlow, Apache Kafka, Apache Spark, and Python- based AI workflows, two days of three concurrent tracks on topics such as predictive data pipelines, AI in the physical world, deep-learning applications and practices, and real-world data engineering. We also had code labs on topics such as TensorBoard, R, and more. This year, at the seventh annual QCon New York, our second year in Time Square, it felt like the emerging theme was diversity and inclusion. The event had a particularly positive atmosphere that made for something truly special, and we got a huge amount of positive feedback from attendees and speakers about it, both during the event and afterwards. This is something the QCon team has worked on for several years, and it felt wonderful to see that work starting to pay dividends. From a content perspective, attendees at the event got to see keynotes from Guy Podjarny, co-founder of Snyk, talking about “Developers as a Malware Distribution Vehicle”; Joshua Bloch giving a “Brief, Opinionated History of the API”; and Tanya Reilly, principal engineer of Squarespace, giving a thoroughly interesting and unusual talk about the history of fire escapes in New York City and what we as software engineers can learn from them. In mid-November, around 1,600 attendees descended on the Hyatt Regency for the 12th annual QCon San Francisco. QCon SF attendees — software engineers, architects, and project managers from a wide range of industries, including some prominent Bay Area companies — attended 99 technical sessions across six concurrent tracks, “ask me anything” sessions with speakers, 18 in-depth workshops, and eight facilitated open spaces. We’ve already started publishing sessions from the conference, along with transcripts for the first time. 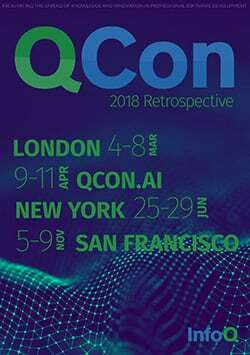 The full publishing schedule for presentations can be found on the QCon SF website. The conference opened with a presentation from Jez Humble and Nicole Forsgren, two of the authors of Accelerate: The Science of Lean Software and DevOps: Building and Scaling High Performing Technology Organizations — one of InfoQ’s recommended books for 2018. InfoQ eMags are professionally designed, downloadable collections of popular InfoQ content - articles, interviews, presentations, and research - covering the latest software development technologies, trends, and topics. Join our team as the new Conference Chair & Community Advocate (Remote & Full-Time). Shape the Future of QCon and software development - Apply Here!